Before reading this report, you should know a few details. 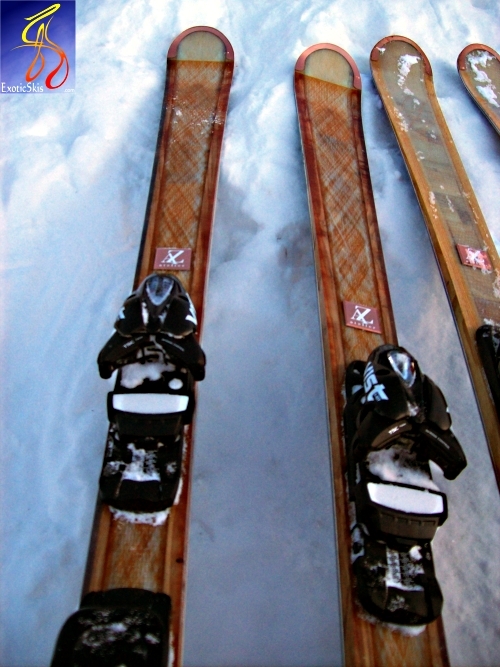 Alain Zanco has two "lines" of skis. The "Stagger" line based on a somewhat standard forumula of geometries, flexes and constructions he has developed over decades of ski designs and testing. There are eleven models divided into four usage categories and four different levels of performance. "The morphology index" relates to the weight, usag and length of the lower leg from the ground to the kneecap axis, proportional to the diameter of the head of the tibia to calculate a waist width. The usage index defines how much usage is on-piste or off piste. Alain also sells a completely customized ski service for roughly €10,000 per pair, which includes a detailed interview/survey process, discussions and a prototype test with Alain with after-the-sale followup contacts. If this sounds rather technical, it is because Alain Zanco is undeniably one of the most experienced and highly regarded ski developer/engineers alive on the planet today. Having been one of the driving forces and bright minds inside Rossignol's race room, R&D, CAD-CAM, engineering and production workshops for 23 years and receiving many patents for his work, he has developed WorldCup-winning skis with more shapes, constructions and materials than perhaps anyone in recent memory. 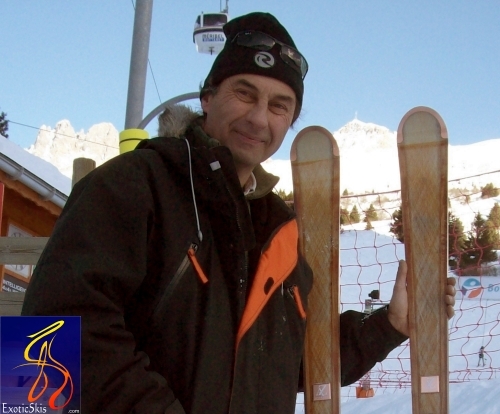 Having spent so much time designing and customizing some of the World's most high-performance racing skis for the World's most elite skiers, Alain knows how skis behave and how to influence the handling and feel of skis on snow for different skiers. Alain also knows the detailed personalities of different materials used in different ski constructions. Rossignol's massive R&D efforts over the last several decades and “build whatever it takes to win WorldCup” race room technology allowed Alain to gain access to nearly limitless high-tech and traditional materials and evaluate how they work in the real world. Alain knows skis and how to build them. He also charges premium prices for his labors and inventions. 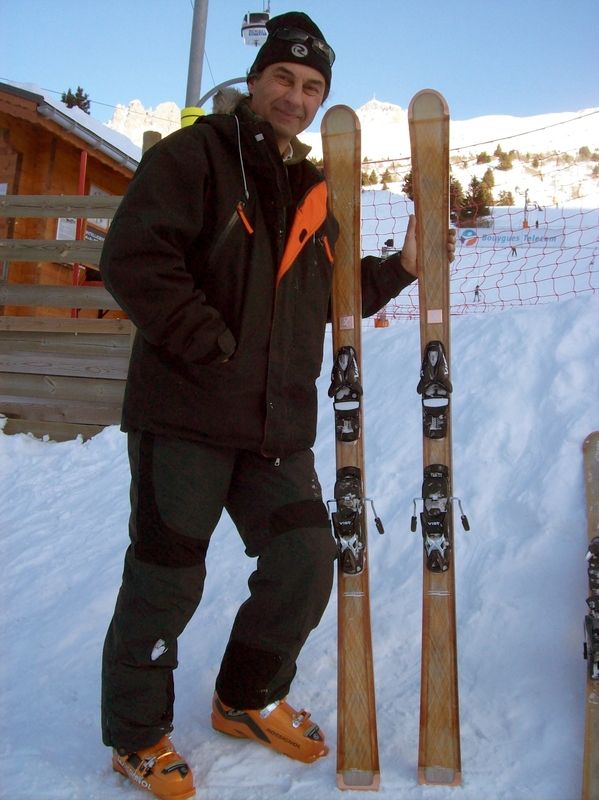 Without a doubt, Alain Zanco is a special person making special skis. Funny thing is, he has decided that simple wood and fiberglass constructions are the best! 60-25: On trail and out with a majority on trails. 60-50: On trail and out with a majority out off trails. 80-25L: On trail and out with a majority on trails. 80-25: On trail and out with a majority on trails. 80-50: On trail and out with a majority out off trails. 100-50: On trail and out with a majority out off trails. A beautifully built, predictable, secure, strong, stable, responsive, manuverable ski able to go pretty much anywhere you want to point it on piste. Capable of short or longer-radius turns without requiring excessively athletic input. Smooth and confident ski which is very nice, but did not leave a strong impression considering its €2,800 price. 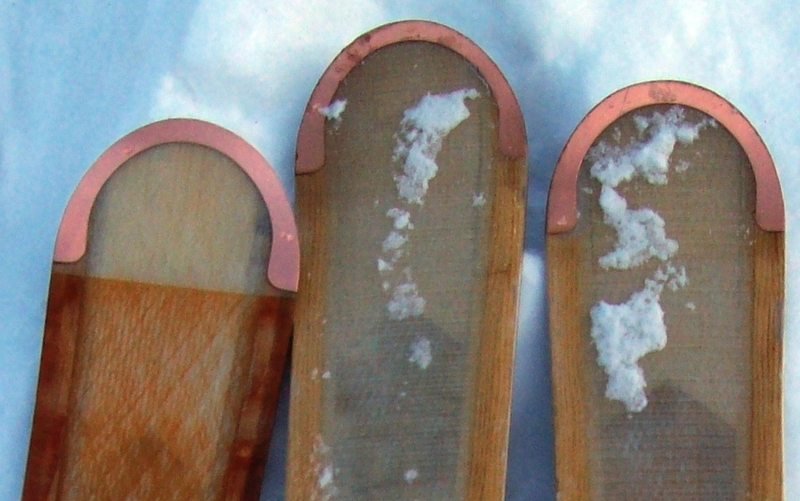 An experimental ski with different wood edge/sidewall supports on the left and right sides of each ski. 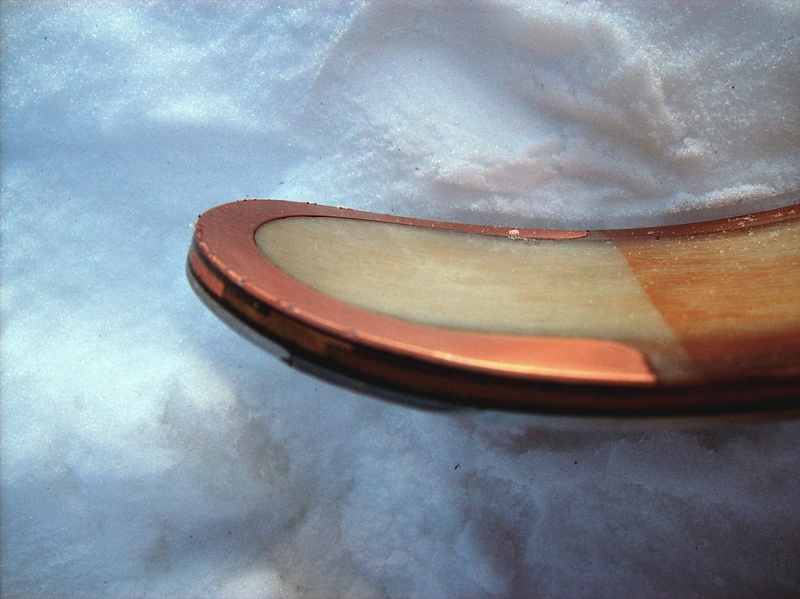 Black walnut supports one edge, ash supports the other (see the photos), allowing the skier to switch skis and switch between "recreation turn" and "race-turn" inside edge behaviors. These were probably the best carving skis I have ever tried in 46 years of skiing many, many types of skis. Beautifully built and finished with an eerie ability to set an arc at nearly any speed and carry minimal or intense angulation or pressure through the turn as commanded by the driver. World-Cup ride without requiring World-Cup athleticism. Simply stunning for expert skiers on-piste and breathtakingly expensive at €3,300. Double layers of special biaxial ibreglass. STAGGER M80-00 AZM3/M4 expert skier "Prototype"
Double layers of triax fiberglass. These skis have a fit and finish of superb quality, undeniably showing some of the best craftsmanship I have ever seen in a ski. Fanatically accurate fit of components throughout the tip, tail and body of the ski. 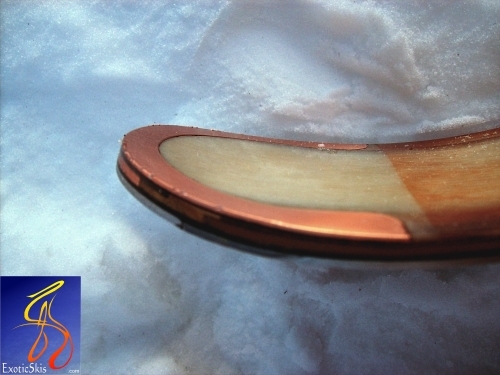 Fanatically fine finish of the ski sidewalls, tip and tail revealing perfect alignment, pressing and final treatment. Really different "semi-transparent/transluscent construction" where you can see the core is flanked by two "catamaran" edge/sidewall support beams tapering to tip and tail. The core and fiberglass is visible through the semi-clear, transluscent-like finish lacquer/varnish/polyurethane (not sure exactly what the glossy finish really is). Very interesting look and construction. Elegant copper tip and tail wraparound protectors complete the minimalist-look nicely. Smooth, strong flexes with plenty of strength and power to sustain a load, but not "burly" or "stiff" feeling at all. Nicely damp with plenty of rebound snap if flexed quick or deep and released. Definitely not a "softie" luxury ski, but it feels like there is performance in the ski waiting to come out. More racy feel than recreational feel by hand. Definitely distinctive appearance with beautiful, caring construction details and finish. Warm and inviting look to these skis. 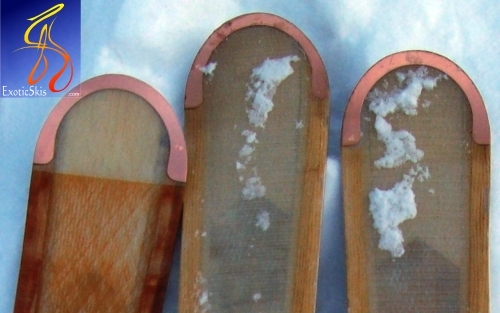 Geometry is not radical, but typical of many piste carving skis. The ski feels and looks like it would last for many years, unlike some skis which feel like they will work well for a season or two, but might become limp and loose their power if they see hard usage for a few seasons. Cold, dry, packed manmade base conditions with some fresh snow several days old groomed into the surface. I skied this model first after beginning the day using the Spoilt Racecarve with somewhat similar geometry for a few hours. The AZ ski was noticably lightweight, although not impressively so, but nonetheless a svelte carving tool. The surface was buffed and firm man-made snow with some fresh snow from several days previous groomed into it for a few nights, so it was perfect for testing a carving ski. The first few turns were smooth, predictable and it only took about six or eight turns to figure out how the ski wanted to be angled and pressured to intiate, hold and finish its turns at various speeds (that is a good thing). I immediately noticed this "intermediate ski" could be angled and pressured beyond the degrees normally associated with "intermediate" skis I am familiar with, which was fun. I then noticed the ski required a little concientious thought to finish the turns since it did not exhibit the "turn autocompletion" behavior of some intermediate skis and would anticipate a direction change similar to a higher-performance ski in this category and straighten its curve in a well-behaved manner when pressure was released slightly. The Stagger M80-00 AZM2 was smooth and inspired confidence at any speed and handled different terrain and angles and pressures gracefully with excellent manners at all times. It required slightly more effort to hold an arc than some "intermediate" skis, but it's tenacity and grip on the surface was proportionally better and would only protest when pushed too hard on really, really hard surfaces. This ski is an excellent cruiser happy to travel anywhere on the frontside of a resort. 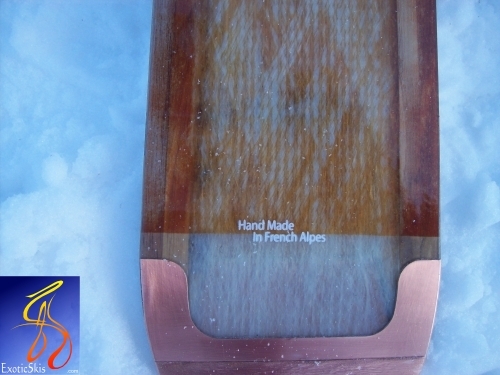 While I did not get a chance to try it on soft snow, Alain admits it is not a powder ski, and while it is perfectly usable in softer snow, it is designed for optimum behavior on "the track" or groomed surfaces. I would not hestiate to recommend this ski to any advanced intermediate or expert skier looking for a beautifully hand-crafted ski built by a World-famous ski builder at a premium price. They could definitely become collectors' items. My regret is only that I expected something amazing or fantastically different or revolutionary with the M80-00 AZM2 ski. It did not give me a revolutionary ride or impress me with some kind of "wow" performance, but was an very, very capable groomed surface ski for advanced intermediates to experts. It definitely has a higher-performance envelope than "typical" intermediate skis, and that may be its real performance value since you could "almost" race this ski, but probably would not. What's more interesting is its ability to sustain a level of performance and quiet composure on the snow usually reserved for a ski containing titanal or other metal sheets. 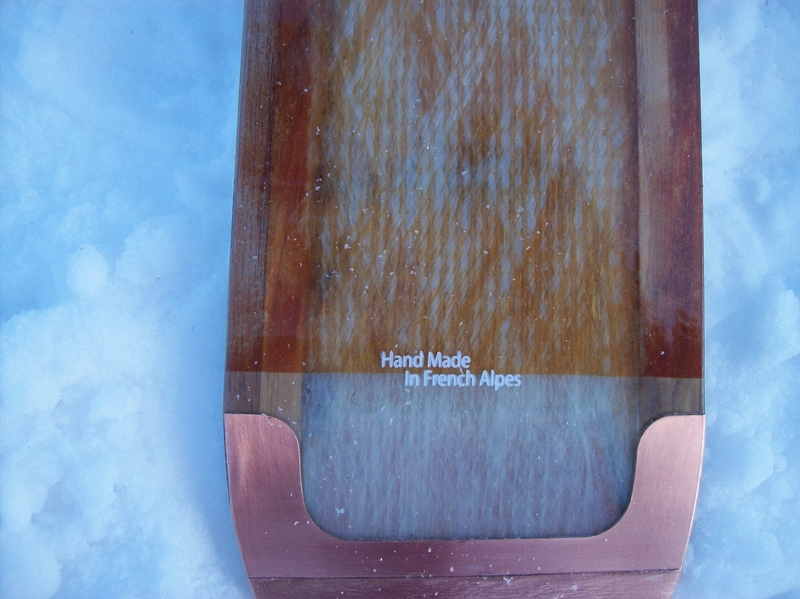 This ski contains no such metal sheets - only wood and fiberglass. I think Alain's M80-00 AZM2 would be great for a skier who is interested in a ski to take them to the next level beyond intermediate skills rather than someone content to stay in their intermediate groove. Overall, this ski is a beautifully crafted, unique product resulting from a passionate attention to detail and quality. It does not give you a really different ride than some other skis can for less money, but is of exquisite quality, unique construction and appears to be able to last for many seasons....and it's hand-made by Alain Zanco. Besides, if you want it to behave differently...Alain will make you a custom ski to your specifications if you wish to spend the money. I skied this pair of skis immediately after trying the intermediate skis (same geometry and length) - same trails, same conditions - Alain and I had the same boot sole length, so we just swapped skis. 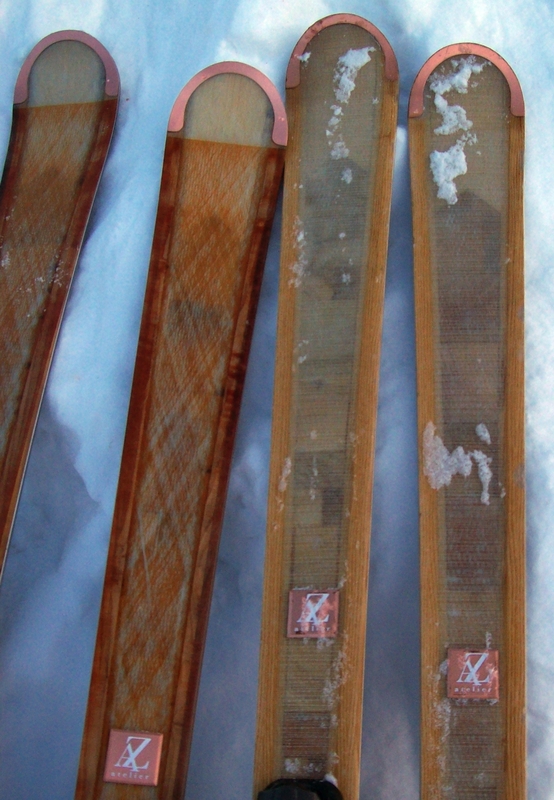 These skis were "experimental" because Alain was evaluating the behavior of two different species of wood to support the edges as sidewalls in his "catamaran" construction. Each ski had a black walnut sidewall/edge support on one side, and an ash sidewall/edge support on the other. 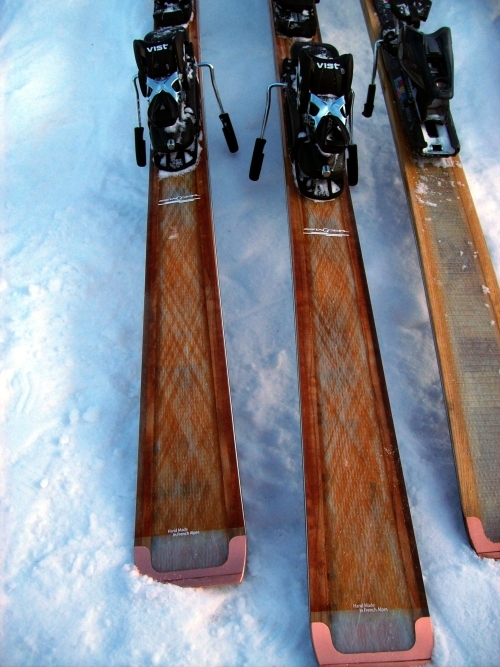 The skis were symetrically built so you could try walnut as your inside edge supports or ash just by swapping skis. I tried the "softer" black walnut edge supports first. Although this pair of skis had the same geometry and length and identical tune as the "intermediate" model (AZM2), it was like stepping from a Beechcraft onto an F-18. 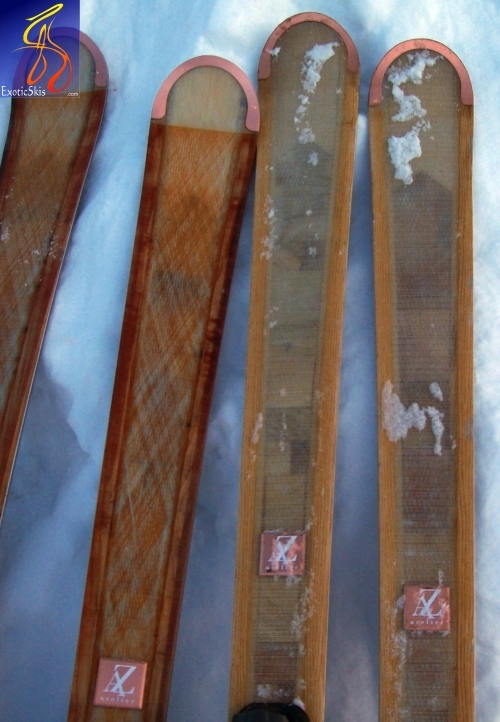 These skis had a grip and authoritative confidence like an race stock ski collegiate racers get, but did not require constant vigilance or olympic-level strength and stamina to ski them. You could ski them at a leisurely pace without being hyper-alert about making mistakes or muscling them to stay on track, but - like driving a street-legal racing car - you really don't find yourself spending much time in the leisure zone. These skis immediately upped my average speed by 30% and increased my G-forces and angles of contact and made me grin. Extremely secure at any speed and no real upper speed limit indications. 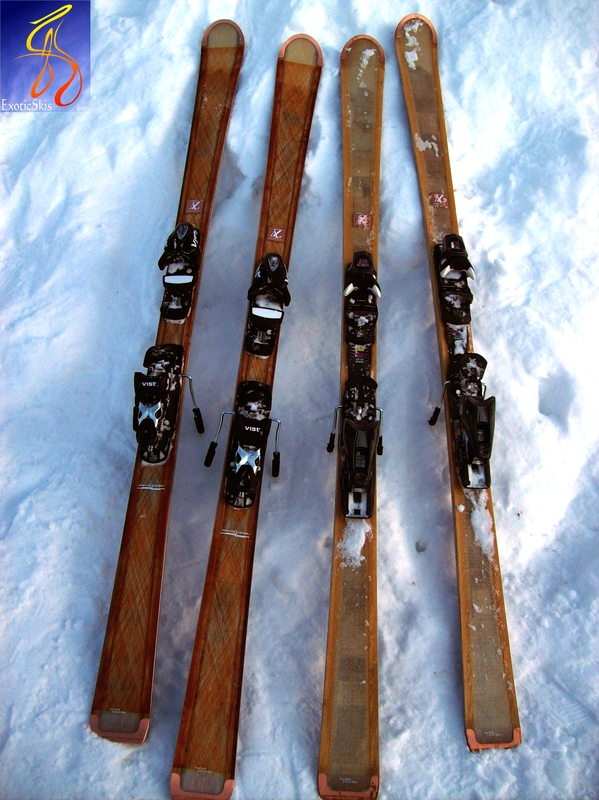 The ski was easily initiated into a turn with a bit of deliberate roll onto an edge and movement slightly forward of center to engage the "pull" of a race ski without the need to maintain muscle pressure to keep it on its arc and prevent a "straightening" of the ski back to the fall line. Very powerful, yet controlled acceleration from the entire ski body. Basically, you could generate nearly any desired amount of forward propulsion you wanted while on edge or coming off edge. Completely stable, completely well behaved and maintained excellent feedback through my feet and kept a secure and confident contact with the hardpack at all times without ever demanding great strength or extraordinary vigilance from me. It was as if the essence of a high-level racing ski was delivered into an expert-level carving ski, but the top-gun pilot's license was not required. I was giddy and seduced after one run. My ride up the lift after the first run was interesting because I just stared at the skis the whole time I talked to Alain about my experience, trying to describe it with my few French vocabulary words and phrases in English Alain could comprehend. The second run reminded me that this ski rewards those who maintain technical excellence and discipline in their turns. You can be sloppy and lazy without any great penalty on these skis, but you really don't gain anything from such behavior. Focus your technique, look farther down the trail than usual and plan your arcs to coincide with your desired surface, and you've got a really, really nice ride. These skis like to carve and they don't really care how fast you are going. The same confident, controlled, vibration-free behavior exists when you are going at an easy pace, or at speeds you'd loose your lift pass for. This ski likes to have a driver, not a rider. If you don't finish your turns, you will feel it politely (like a thoroughbred turning to look at you on its back during a cross-country course event as if to say "hey, what are you doing back there...are you serious about this ride, or what?"). Very precise, very effective and extremely refined performance on piste. Better than many, many race skis I've tried in the past. 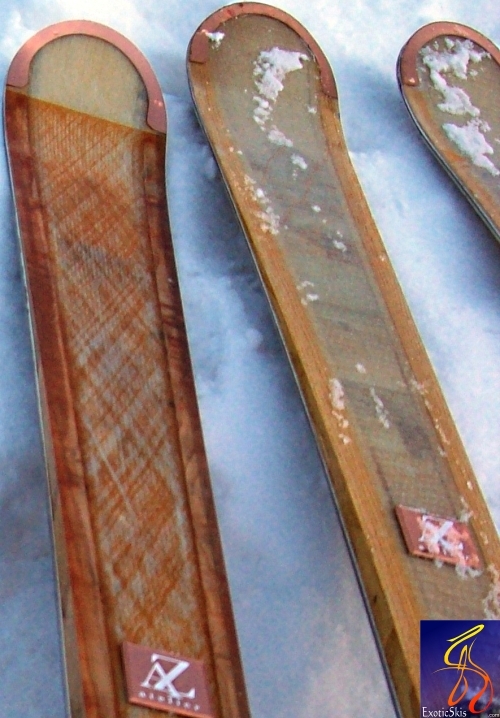 Then I swapped skis on the next run to try the ash edge support "race" behavior of these prototypes and compare it to the black walnut edge support I just enjoyed. Well, in two turns I was convinced. The ash edge support produced a higher level of precision - seemingly surgical on the snow - than the black walnut edge support. The ski allowed me to enjoy perhaps 15% more lead time into turns (if that makes any sense to you) and provided the ability to precisely adjust edge angle and resulting radius changes en-route with great ease and confidence. I had a conversation going between me and my edges that just doesn't happen very often. Superb traction, speed and elegant angulation was possible on the hardpack, all while the ski remained quiet, refined and yet had any amount of rebound in reserve you might demand at an time. While some race skis can deliver this level of grip, acceleration and speed, they usually require a very strong skier with excellent skills who has great stamina and vigilance. I can have fun on these kinds of skis, but usually for no more than a few runs or half day at most. This ski from Alain Zanco made me feel like I had been given a guest pass to drive a factory race car, but didn't need special training or physical prowess to enjoy it. Excellent. Perhaps the finest carving ski I have ever tried. Period. Much too expensive for my budget, but a perfect example of "you get-what-you-pay-for". All this performance wrapped in a beautiful, handmade package by one of the most experience ski engineers in the World. I hope I can try one again (or win the lottery). STAGGER M80-00 structure AZM2 "intermediate skier" = BMW or Audi 5 series sedan: Beautiful, capable and pleasing for all-day easy driving at slow or higher speeds, but the same performance might be available for less money, unless you really want the look and high-quality you get by paying more. STAGGER M80-00 AZM3/M4 "expert skier prototype" = GT3 racecar (Audi R8 GT3, Lamborghini, Lotus) with a softer clutch and steering-assist so civilians can drive it without getting sore. The more you put in, the more you get out. You don't have to eat your Wheaties to drive this one, but you'll appreciate it if you do. Ability to switch edge behavior is like switching from "tour" to "Sport" on your sportscar transmission. I told Alain I hope this ski is available in production - enthusiasts will love it. AZM3 prototype with "race edge" ash supports on inside edges.